"We have been very impressed with the ease of installation"
Keyways were responsible for installing a Salto electronic access control system for one of the world's largest aviation services companies in the world. The combination of our expert installation engineers and the class-leading Salto system was a great success and is to be introduced to other UK airports where Servisair Cargo operate. Servisair Cargo operate in 31 different locations worldwide, 20 of these are in the UK and Ireland and handle 1 million tonnes of cargo a year on behalf of 600 customers. Due to their UK business constantly growing they wanted to improve the safety and security of airside facilities and save time without compromising on flexibility, control or security. SALTO Systems were chosen and Keyways, as the local SALTO business partner, were appointed to install the integrated access control system at Manchester airport. 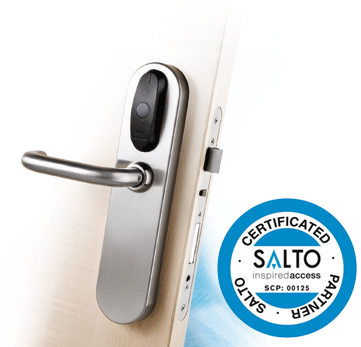 "We have been very impressed with the ease of installation and overall appearance of the Salto product. It does everything we want of it which is access control principally, but some department managers at the company are also using its built-in audit trail facility on the main entrance doors to log in employees as they arrive for work."